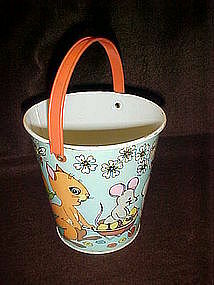 Great tin sand bucket made by Chein. Easter themed. A squirrel with a mouse in a wheelbarrow follows a rabbit with a big carrot, who folllows alittle duck and turtle. Sunshine with a smiling face and flowers. Measures 5 1/4" tall plus the bail. All metal, white inside, with the litho decorations on the outside. No rust, holes, or dents. No scratches. A little paint wear on the rim on the white area edges. A great piece!Need more photos I will be glaad to email them to you.